Annette Gisby grew up in a small town in Northern Ireland, moving to London when she was seventeen. 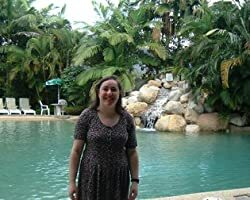 She writes in multiple genres and styles, anything from romance to thriller or erotica to horror, even both at the same time. When not writing, she enjoys reading, cinema, theatre and travelling the world despite getting travel sick on most forms of transport, even a bicycle. Sometimes you might find her playing Dragon Quest or The Sims computer games and watching Japanese Anime. She lives in Hampshire with her husband, a collection of porcelain dolls, cuddly toys and enough books to fill a library. It's diminishing gradually since the advent of ebooks, but still has a long way to go. Please enter your email address and click the Follow button to follow Annette Gisby!